The Geiger counter is an instrument used for measuring ionizing radiation used widely in such applications as radiation dosimetry, radiological protection, experimental physics and the nuclear industry. 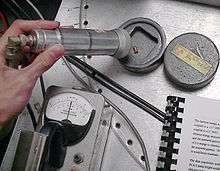 A Geiger counter consists of a Geiger-Müller tube, the sensing element which detects the radiation, and the processing electronics, which displays the result. The Geiger-Müller tube is filled with an inert gas such as helium, neon, or argon at low pressure, to which a high voltage is applied. The tube briefly conducts electrical charge when a particle or photon of incident radiation makes the gas conductive by ionization. The ionization is considerably amplified within the tube by the Townsend discharge effect to produce an easily measured detection pulse, which is fed to the processing and display electronics. This large pulse from the tube makes the G-M counter relatively cheap to manufacture, as the subsequent electronics is greatly simplified. The electronics also generates the high voltage, typically 400–600 volts, that has to be applied to the Geiger-Müller tube to enable its operation. There are two types of radiation readout; counts or radiation dose. The counts display is the simplest and is the number of ionizing events displayed either as a count rate, commonly "counts per second", or as a total over a set time period (an integrated total). The counts readout is normally used when alpha or beta particles are being detected. More complex to achieve is a display of radiation dose rate, displayed in a unit such as the sievert which is normally used for measuring gamma or X-ray dose rates. A G-M tube can detect the presence of radiation, but not its energy which influences the radiation's ionising effect. Consequently, instruments measuring dose rate require the use of an energy compensated G-M tube, so that the dose displayed relates to the counts detected. 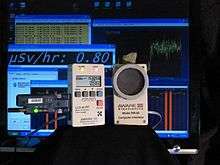 The electronics will apply known factors to make this conversion, which is specific to each instrument and is determined by design and calibration. The intended detection application of a Geiger counter dictates the tube design used. Consequently, there are a great many designs, but they can be generally categorised as "end-window", or windowless "thin-walled", or "thick-walled", and sometimes hybrids of these types. 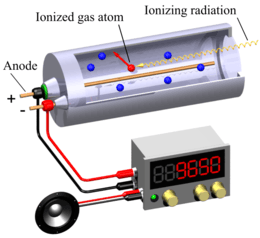 The first historical uses of the Geiger principle were for the detection of alpha and beta particles, and the instrument is still used for this purpose today. For alpha particles and low energy beta particles the "end-window" type of G-M tube has to be used as these particles have a limited range even in free air, and are easily stopped by a solid material. Therefore, the tube requires a window which is thin enough to allow as many as possible of these particles through to the fill gas. The window is usually made of mica with a density of about 1.5 - 2.0 mg/cm2. Alpha particles have the shortest range, and to detect these the window should ideally be within 10 mm of the radiation source due to alpha particle attenuation in free air. However, the G-M tube produces a pulse output which is the same magnitude for all detected radiation, so a Geiger counter with an end window tube cannot distinguish between alpha and beta particles. A skilled operator can use varying distance from radiation source to detector to differentiate between alpha and high energy beta particles, but with the detector in close contact with the radiation source the two types are both detected and are indistinguishable. The "pancake" Geiger-Muller detector is a variant of the end window probe, but designed with a larger detection area to make checking quicker. However the pressure of the atmosphere against the low pressure of the fill gas limits the window size due to the limited strength of the window membrane. Some beta particles can also be detected by a thin-walled "windowless" G-M tube, which has no end window, but allows high energy beta particles to pass through the tube walls. Although the tube walls have a greater stopping power than a thin end window, they still allow these more energetic particles to reach the fill gas. End-window G-M detectors are still used as a general purpose portable radioactive contamination measurement and detection instrument, owing to their relatively low cost, robustness and their relatively high detection efficiency; particularly with high energy beta particles. However, for discrimination between alpha and beta particles or provision of particle energy information, scintillation counters or proportional counters should be used. Those instrument types are manufactured with much larger detector areas, which means that checking for surface contamination is quicker than with a G-M instrument. The article on the Geiger-Muller tube carries a more detailed account of the techniques used to detect photon radiation. For high energy gamma it largely relies on interaction of the photon radiation with the tube wall material, usually 1–2 mm of chrome steel on a "thick-walled" tube, to produce electrons within the wall which can enter and ionize the fill gas. This is necessary as the low pressure gas in the tube has little interaction with high energy gamma photons. However, for low energy photons there is greater gas interaction and the direct gas ionisation effect increases. With decreasing energy the wall effect gives way to a combination of wall effect and direct ionisation, until direct gas ionisation dominates. Due to the variance in response to different photon energies, windowless tubes employ what is known as "energy compensation" which attempts to compensate for these variations over a large energy range. Low energy photon radiation such as low energy X rays or gamma rays interacts better with the fill gas. Consequently, a typical design for low energy photon detection for these is a long tube with a thin wall or with an end window. The tube has a larger gas volume than a steel walled tube to give an increased chance of particle interaction. 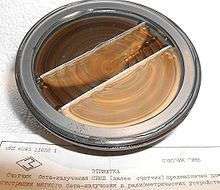 In the 1930's a mica window was added to the cylindrical design allowing low-penetration radiation to pass through with ease. In the United Kingdom the HSE has issued a user guidance note on selecting the best portable instrument type for the radiation measurement application concerned. This covers all radiation protection instrument technologies and is a useful comparative guide to the use of G-M detectors. The guide does not recommend the G-M detector for mixed alpha and beta contamination detection, and they are only recommended as "satisfactory" for beta-only contamination. However, for gamma and low-voltage X-rays they are recommended as the best instrument type. 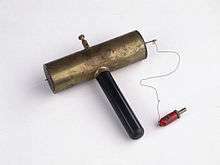 It was not until 1928 that Geiger and Walther Müller (a PhD student of Geiger) developed the sealed Geiger-Müller tube which developed the basic ionization principles previously used experimentally. 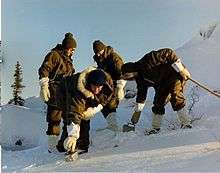 This was relatively small and rugged, and could not only detect alpha and beta radiation such as prior models but also gamma radiation. Now a practical radiation instrument could be produced relatively cheaply, and so the Geiger-Muller counter was born. As the tube output required little electronic processing, a distinct advantage in the thermionic valve era due to minimal valve count and low power consumption, the instrument achieved great popularity as a portable radiation detector. 1 2 3 4 5 6 7 ’’Geiger Muller Tubes; issue 1’’ published by Centronics Ltd, UK. 1 2 Selection, use and maintenance of portable monitoring instruments - Ionising Radiation Protection Series No 7, issue 10/01. Pub by United Kingdom Health and Safety Executive. ↑ Liebson, S. H. (1947). "The Discharge Mechanism of Self-Quenching Geiger-Mueller Counters". Physical Review. 72 (7): 602–608. Bibcode:1947PhRv...72..602L. doi:10.1103/PhysRev.72.602.